Lansinoh Nursing Prize Pack: JLin M.
Free Birds/Chuck E. Cheese: Jennifer T.
If you see your name above, be sure to check your e-mail. I do send out verifications. You often aren't required to respond, but it's nice to be sure the address and prize choice you entered is correct. Also, if you didn't supply your address or prize selection, I will need you to provide them. Make sure you enter all of the current live giveaways! 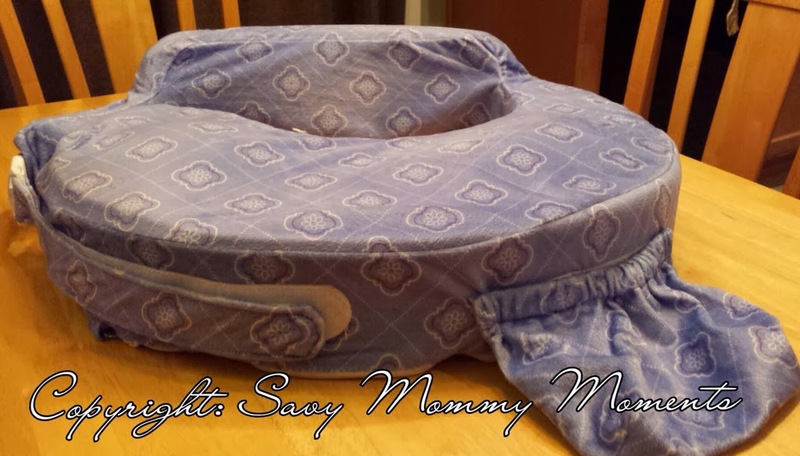 Baby Comfy Nose Review & #Giveaway! 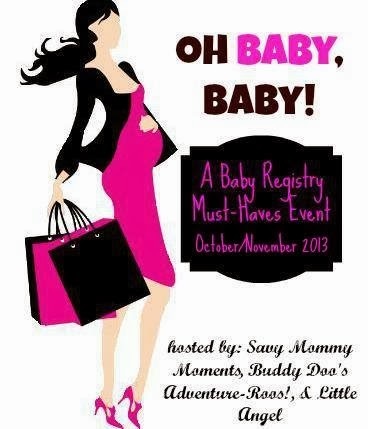 Oh Baby Baby Registry Event! Personally, baby boogers drive me crazy! As soon as I see they are up there and stuffing up my little ones nose, I HAVE to get them out. However, I detest those little aspirators that won't even get them to budge and the baby always hates! It never ends with a booger exiting their nose, but rather with me and baby in tears! 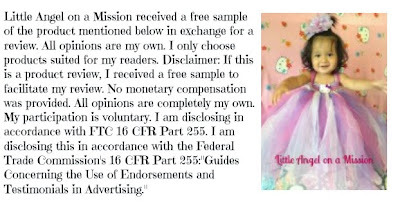 Read below a review by my friend at Little Angel on a Mission about a revolutionary new product that makes boogie extraction a breeze for mommy and baby! 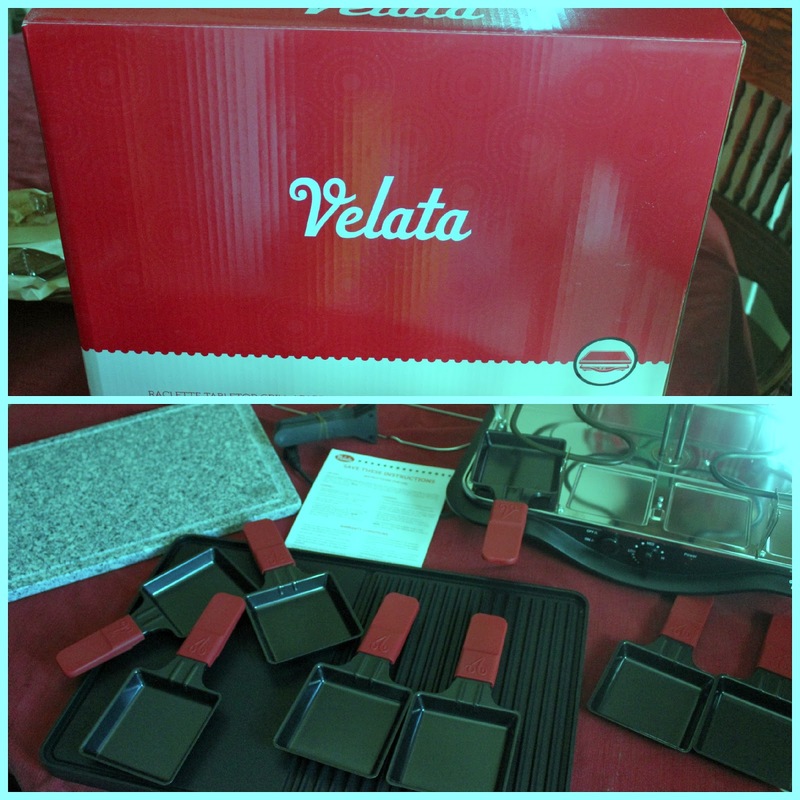 Beba Bean Review & #Giveaway! Oh Baby Baby! Registry Event! When someone has a baby, it can be difficult to decide and find the perfect gift to send. Flowers are okay, but honestly it's kind of like giving someone who has a new human to care for something else to take care of. 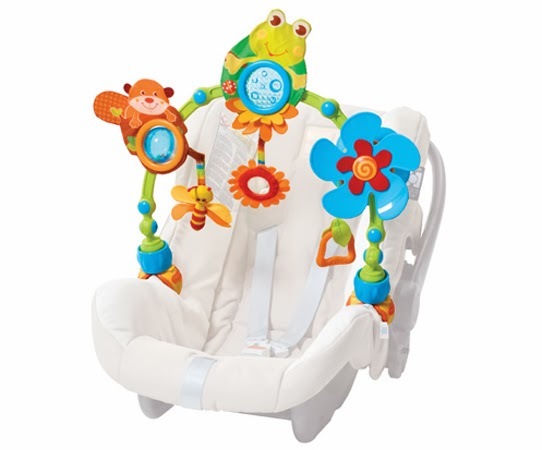 Fruit baskets are good too, but what new parents really love are cute new things for baby! Check out the below review and giveaway of Baba Bean by my blogger friend at Little Angel on a Mission! I just love Thanksgiving and this holiday season there is a fun new movie that has been released, Free Birds! This awesome movie has paired up with Chuck E. Cheese to bring you some awesome promotions! The buddy comedy stars pizza-loving Reggie, voiced by Owen Wilson, and Jake, voiced by Woody Harrelson as a turkey tag-team intent on taking turkeys off the Thanksgiving menu. It also happens to be Chuck E. Cheese’s big-screen debut. In turn, Chuck E. Cheese’s locations will feature exclusive Free Birds merchandise and activities as part of the company’s fall in-store promotion. From collectable Rock-N-Wristbands available with any pizza purchase deal and printable activities for the kids to Chuck E.’s Movie Matchup Sweepstakes for free prizes, there are lots of fun and exciting activities surrounding the partnership! Just in time for the holidays, “Free Birds” stars two turkeys from opposite sides of the track who must put aside their differences and team up to travel back in time to change the course of history – and get turkey off the menu for good. Jake and Reggie love pizza, and we're sure your family does, too! Show your “Free Birds” support by collecting Rock-N-Wristbands in stores now! Collect all four with any pizza purchase deal at Chuck E. Cheese’s this fall featuring Chuck E., his guitar, and Jake and Reggie from the “Free Birds” movie in theaters Nov. 1! 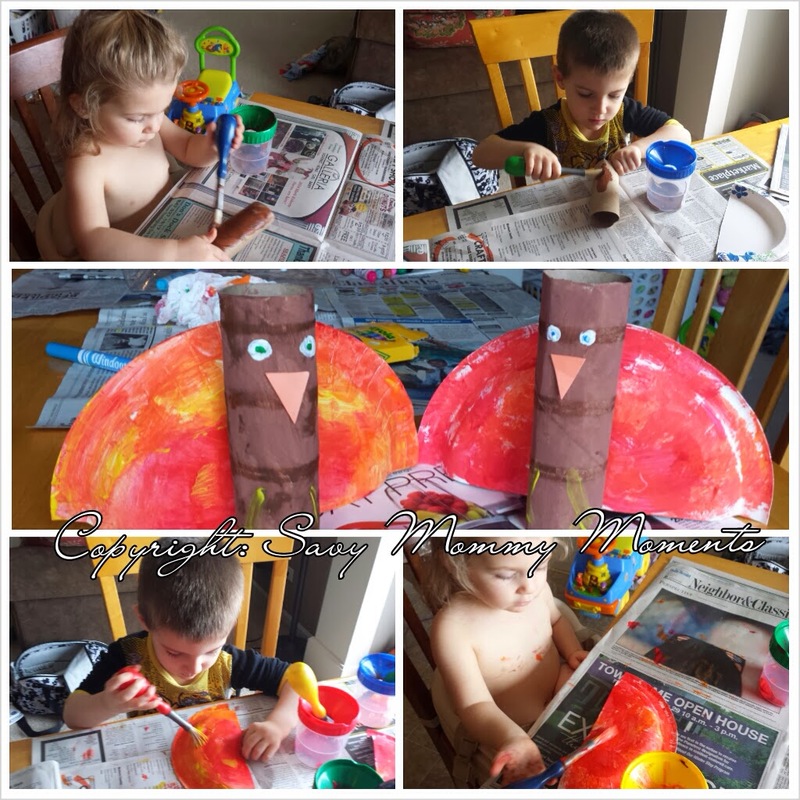 If you’re in need of some indoor activities for your little turkeys as the weather gets cooler, check out these Free Birds inspired connect the dots, word search, maze and coloring sheets from Chuck E. Cheese’s. 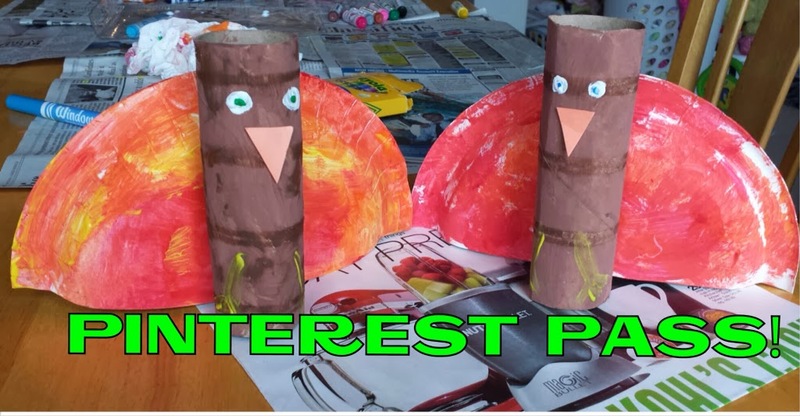 Additionally, with the help of special “Free Birds” and Chuck E. Cheese’s Rewards Calendars, if the kids set – and stick with – new fall goals like gobbling up those veggies and saying thanks, they can receive 10 free tokens for their hard work when completed. 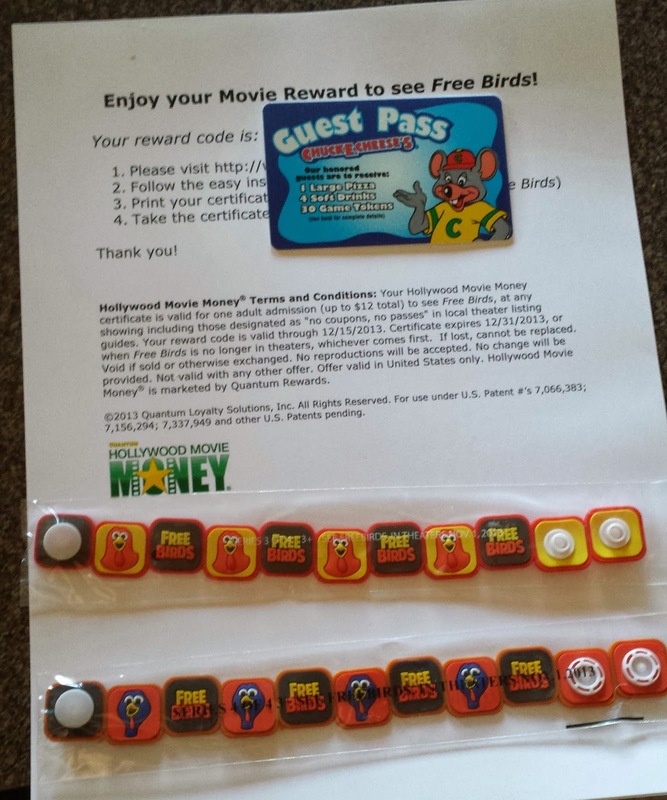 For additional resources, exclusive video content and information about current promotions involving Chuck E. Cheese’s and “Free Birds,” fans can visit www.chuckecheese.com/wristbands or connect with Chuck E. Cheese’s on Facebook, Twitter, Pinterest, YouTube and foursquare. Fans can also gobble up all things “Free Birds” by following the #FreeBirds hashtag or visiting the movie’s Facebook, Twitter and YouTube channels. 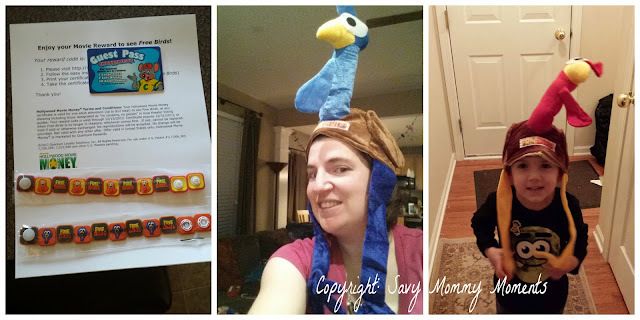 Immediately upon opening up the box, my kids went wild over the Turkey Hats! And to be honest, so did Savy Daddy and I. The hats are really made nicely and easily fit on kids/adults heads! They have been a hit ever since receiving them! Savy Daddy and Big N., also took full advantage of the movie passes and went to see Free Birds! Before they left, Big N. picked out his favorite Rock-N-Wristband to wear and was super excited that it featured one of the main characters! As for the movie, Big N. really loved it and came home telling me all about the funny parts and quoting some of it! Savy Daddy said it had some really funny lines and kept him amused which was a bonus for a kids themed movie! Overall, they both really enjoyed the comedy, characters and theme of the movie, as well as the fact that it was the perfect length at just an hour and a half long. I am pretty sure Big N's favorite part was the pizza in the movie. As for the Chuck E. Cheese passes, since Baby L. was born on 11/1/13, we haven't had a chance to go as we want to limit the germs we bring into our home. We will likely use the passes early next year when she is bigger and can handle anything better. But, we really look forward to going to Chuck E. Cheese because they have a ton of fun stuff for our kids to do. You can check it out here! Learn More: Exclusive video content and information about current promotions involving Chuck E. Cheese’s and “Free Birds,” you can visit www.chuckecheese.com/wristbands or connect with Chuck E. Cheese’s on Facebook, Twitter, Pinterest, YouTube and foursquare. 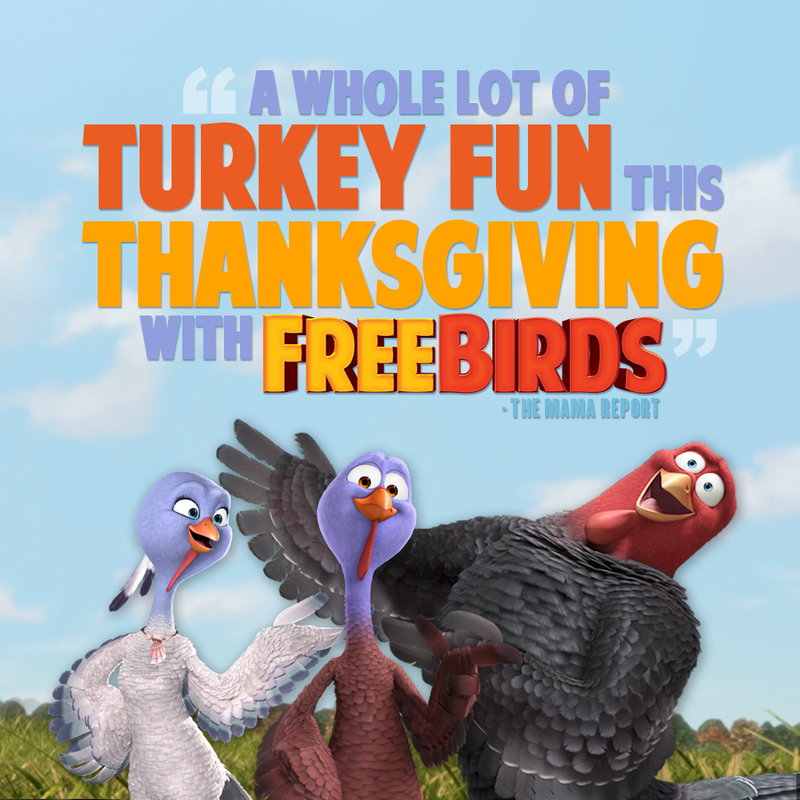 Fans can also gobble up all things “Free Birds” by following the #FreeBirds hashtag or visiting the movie’s Facebook, Twitter and YouTube channels. Check out the move trailer below! 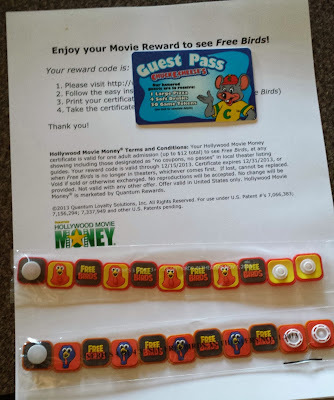 Win: One luck fan will win 2 movie passes to see the Free Birds movie, 1 Chuck E. Cheese pass good for one large pizza, four drinks and 30 tokens, and two exclusive Free Birds Rock-N-Wristbands! 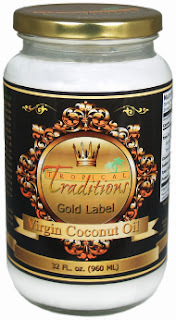 Giveaway Ends 11/18/13 at 11:59pm CST. Open to U.S. Residents Only. Well, it's been 11 days since Baby L. entered our crazy life! After having two previous babies in the last four years, I figured this one would be easy. Haha! Baby born with cord wrapped very tight (daddy didn't get to cut this time since it was an emergency) which led to delay in initial response cries (cue panicky mommy) and slightly lower APGAR scores 7/9. Largest baby born at 8# 6oz. Baby born with most amount of hair! Full head and almost jet black! Baby who refuses to sleep anywhere except attached to mommy. 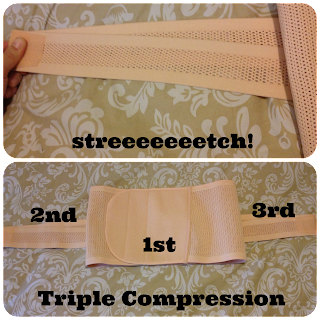 Thank you Moby Wrap! Prayed for sleep.. Breast milk jaundice. Yellow baby! Prayed for poop.. Very slow weight gain (our current battle). Goodbye sleep that we prayed for...now we must wake her up every two hours. 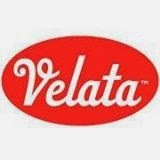 Two year old with a 48 hour fever which led to baby and mommy quarantine. Super daddy to the rescue! Other than that we have enjoyed lots of hugs, kisses, a big sister who adores her baby sister to the moon and back and a big brother who doesn't want to hold his new baby sister but admits he still likes her. All in all, it's not going exactly as expected but we love our bigger family and every single day together is a new and exciting adventure. Next week, I'll tackle being home alone ALL DAY with three kids under 4! It's quickly approaching that time of year again...winter and with it comes lots of sniffles and dusty, stale surfaces inside your home. 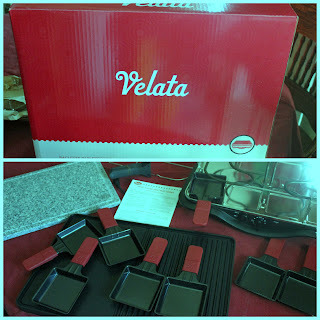 No one has time to lug out the big ole vacuum every day to keep things clean. Wouldn't it be nice to have something smaller to help keep your home clean and healthy? 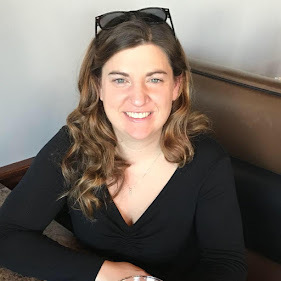 Read below about the Allergy Buyers Club and the Dyson DC34 Handheld Vacuum from my blogger friend at Open Hands. 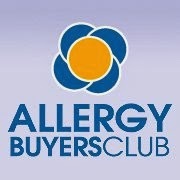 Since 1998, Allergy Buyers Club has specialized in allergy relief products. Their best in class products are natural, green and hypoallergenic. They appeal to all those who wish to have a clean, healthy home that is free of pollutants. 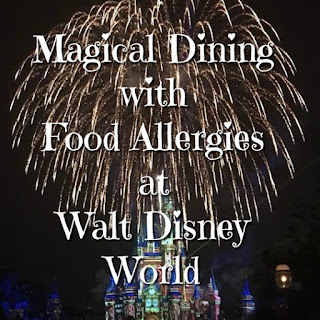 When I was introduced to Allergy Buyers Club, I was incredibly impressed with the wide variety of products. They offer water filters, mattresses and more. Shrinx Belly Postpartum Wrap Review & #Giveaway: Day 17: Oh Baby Baby! Registry Event! What's the first thing you want to do after having a baby, that well, isn't directly involving said baby (because we all know snuggles is #1-3 on that list!). For me, it was to lose the baby weight. Honestly, I haven't lost much of it still, but I'm blaming it on the 6 month period where Buddy Doo didn't sleep more than 10 hours a week. I'll let you reread that sentence again. That's less than two hours a day....and he didn't sleep more than 20-30 minutes at a time. Remember THAT when you're upset that your child keeps waking every two hours (but then goes right back to sleep). Needless to say that lack of sleep didn't do well with my metabolism or weight loss. Boo. We just love, love, love Skinny Pop in our house! It's so important to me, as a mother and wife, to provide my family with snack items that don't contain artificial ingredients or chemicals! I mean, it's popcorn! What would you need other than maybe the popcorn and a little salt?! 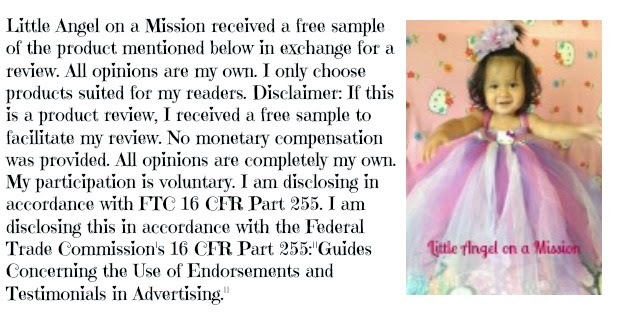 You can read Little Angel on a Mission's review on the Skinny Pop she received here. If you love popcorn this giveaway is for you! Skinny Pop is offering ONE case of popcorn to one lucky reader! Fill out the Giveaway Tool below to enter to win.